I am trying to use the SlideShowExtender in toolkit and I get the following error. Message: Unknown web method GetSlides. Removed "Shared" from the web method declaration. ASMX uses instance methods unlike web method in an ASPX page. That ALMOST worked. The error went away but the image returned was placed after the </form> tag with style="display=none;" when using using F12 developer tools. Can you see anything that would cause that? No, that worked. This is a different issue. Have you tried placing a breakpoint in the web method to verify the web method is operating as expected? I would assume you have more than one image returned or should have more than one. I can't see the markup so I have no idea if you have everything setup correctly. I did a quick google and found these. Below is my markup and it is pretty simple but still no images appear, only a box outline where the image should be. Also, this might help, the img tag results in a src=undefined. According to your codes, I found the image path you have set in the GetSlides web method is wrong. It will only return image file name to the client-side. I am also trying to do this with just code-behind on page as below. 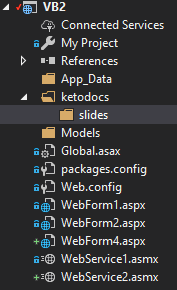 Also note that ketodocs is a virtual folder off the root. And page (.aspx) markup as below. Nevermind...I fixed it from a typo. Thanks.